Think of what follows as a New Orleans All-Star team of the future. Mostly, we define "People to Watch" as new faces who are doing something interesting with their lives that is worthy of our awareness or, in some cases, familiar faces moving in a different direction. Our team is a combination of promising rookies and of veterans playing new positions. Barring injuries or scandals, the season should be a good one. Now, please rise for our national anthem. Theatre Louisiane, the itinerant group of New Orleans-based artists, recently returned from Montreal, where they toured dis+graced, a multimedia performance featuring text from Euripides' Medea and letters of Josephine Bonaparte, a piece that originally debuted in New Orleans at the Zeitgeist theater. Amy Woodruff, the artistic director who founded the group in 1999, compiled the script, designed the set and costumes, and also starred as the main characters in their first one-actor show. Each project, she says, is a learning experience. Her husband, Blake Buchert, a cartographer, is on the board of directors and is chairman of the Board of Trustees for the company, which was incorporated as a non-profit theater in the state of Louisiana in 2001. The self-described group of "allied artists" will begin working on their next project this winter. Woodruff and Buchert, along with Chrispin Barnes and Jennifer Buras, the current resident artists, also look forward to developing more touring opportunities. "We would love to see our work represent Louisiana in a positive light to other parts of the country and the world," says Woodruff. -- S.R. Lake Charles natives Amy Woodruff and Blake Buchert will be recognized in the upcoming "People to Watch" issue of the monthly New Orleans magazine. The husband and wife team are the driving force behind the critically-acclaimed ensemble Theatre Louisiane, which in recent months has toured The Music of Erich Zann to McNeese Theatre and dis+graced to the Montreal Fringe Theatre Festival. Woodruff, a graduate of McNeese State University's Theatre Arts program, is the Artistic Director of Theatre Louisiane, Inc., which she founded in 1999. She specializes in actor-created multimedia performance, and she has trained in modern dance with Andrea Ariel Dance Theatre of Austin, Texas, in classical performance with Shakespeare & Company of Massachusetts, and in ensemble performance with the avant-garde Vortex Repertory Theatre, also of Austin. Woodruff, a member of the International Federation for Theatre Research, has received artist grants from the Louisiana Division of The Arts and the Jazz & Heritage Foundation of New Orleans, and her works are fiscally sponsored by the NYC artists' service organization Fractured Atlas. Buchert serves as chair of Theatre Louisiane's board of trustees, works in production management with the group, and appears on occasion as a Guest Artist. Buchert earned a Bachelor of Arts in Geography from the University of New Orleans, and currently works as a GIS Technician and Remote Sensing Specialist in New Orleans. Buchert and Woodruff were married in Lake Charles in June of 2000. In addition to the couple, the participating artists of Theatre Louisiane will be recognized for their collective interdisciplinary performance work. Also prominently featured will be Theatre Louisiane's video artist Chrispin Barnes. The group's works have been seen at New Orleans spaces such as Zeitgeist Arts Center, the Pickery Art Space, the State Palace Theatre, and the Dramarama festival at the Contemporary Arts Center. Theatre Louisiane can be visited on the web at: www.theatrelouisiane.com. 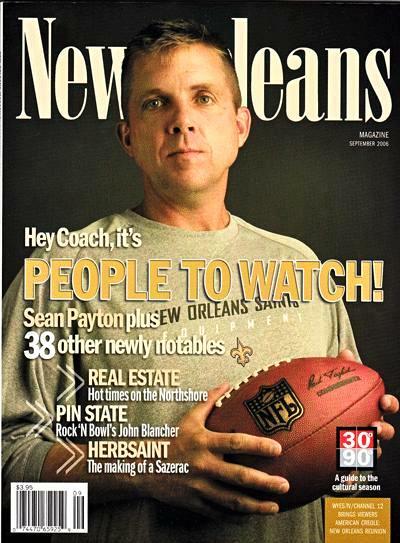 The "People to Watch" feature will be published in the September issue of New Orleans magazine, which is scheduled to hit newsstands at the end of August.